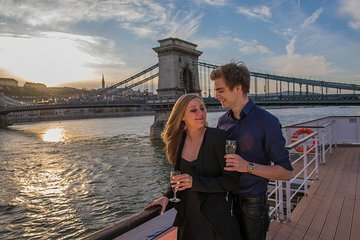 Sorseggia il tuo cocktail preferito mentre ammiri un panorama serale di Budapest, con questa crociera da due ore sul Danubio al tramonto. Sali a bordo di questo confortevolissimo battello, goditi due cocktail gratuiti e la musica folk mentre navighi lungo il fiume al crepuscolo. Ammira i monumenti storici, tra cui il Castello di Buda e del Parlamento illuminati dalle luci della città, il tour prosegue passando sotto i famosi sei ponti, tra cui il Ponte delle Catene. Seleziona l'opzione apposita per includere il prelievo e il riaccompagnamento da e per l'hotel. Scegli il tour che fa per te al momento della prenotazione. Quindi, goditi il trasporto dall'hotel fino al punto di partenza vicino al fiume Danubio, o raggiungilo autonomamente, a seconda dell'opzione scelta. Accomodati su all'aria aperta, o nella confortevolissima cabina interna del battello da crociera; ammira Budapest dal fiume e scegli dal menu il primo dei due drink inclusi (vedi Itinerario). Altre bevande e piatti à la carte possono essere acquistati (a proprie spese). Scegli ciò che preferisci, come un Mojito o un Gin Fizz, sorseggia il tuo cocktail mentre la nave scorre lungo il Danubio. Guarda il sole tramontare e ammira i monumenti patrimonio dell'umanità dell'UNESCO, tra cui la sede del Parlamento e del castello di Buda, lasciati incantare dal modo in cui le luci serali li fanno brillare. Puoi scattare foto mentre navighi sotto il Ponte delle Catene del XIX secolo e sotto gli altri cinque ponti, e goderti la musica dal vivo della band dell'Hungaria Folk Ensemble che suona nel ponte al chiuso. Ascolta le famose melodie popolari ungheresi, goditi un assolo del musicista di cimbalom, la cetra tradizionale ungherese. Mentre la nave viene ormeggiata, non perderti la vista dei monumenti illuminati, poi saluta quest'esperienza di 2 ore scendendo e rilassandoti durante il ritorno in hotel. The sightseeing scene is without a doubt beautiful, BUT if you're walking through the city at night save the money for this tour. They offer super cheap drinks and the deck space is not enough for all the people on board. taking the sunset cruise was one of the highlights of our short trip to budapest. we didn't do the dinner, just the drinks, but i think next time we'll add in the dinner. unfortunately for us it rained so hard to get great pix because couldn't be outside. but seeing the lights of budapest while listening to the music played by the 3 piece band made for an enchanting night. Nice one, you can see all budapest with spectacular views.. recommended! We had an absolutely wonderful time. It was the highlight of our trip. Our children loved it and the views were incredible. The crew couldnt have been nicer and the music was delightful. Lovely activity too, Do note that it is a bit of walk from the meeting point to the boat. The musicians on the boat were awesome! played for the duration of the trip and even took requests! Lovely drinks and staff were really friendly. Excellent and relaxing! While Budapest offers much amazing scenery, the views from the river can't be beat!! The cocktail service was a little slow, and our cruise wasn't full, so I'd imagine that could be a problem on a busy day. But we were pleased with everything about the cruise - the length of time, the friendly wait staff, the strings trio, and of course the gorgeous views of Budapest from the middle of the Danube. I'd consider this cruise again if I returned to Budapest. Cool night, but the trip was a great way to see the sights. Drinks were good, but staff seemed enthralled with a large Bachelorette party. They got all the service. Hard to find wait staff for drinks. Good value, though. I personally think it was poorly organised. We had a central meeting place and had to walk for about 10-15 mins, when it would have been easier to meet at the boat. Whilst I realise you wish to have as many people on board as possible, I thought it was overcrowded and and too many option different drink packages available on one boat so seemed to be a bit confusing. I suggest it would have been better to maybe have one free drink on arrival then go to the bar after that.